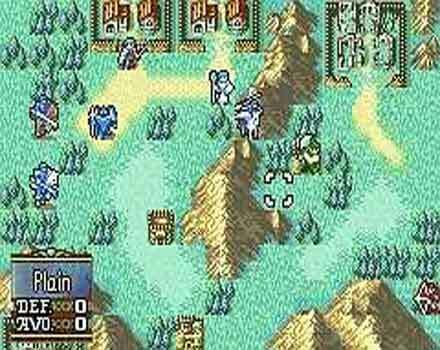 Fire Emblem: The Sacred Stones is almost heartbreaking. Stones is good, great, and damned great in almost every aspect, but an errant death system unfortunately dominates the otherwise solid gameplay in such a way that battles cease to become fun. Stones is a case of blatant and needless self-scuttling, and is, in that sense, a shame. To synopsize: Fire Emblem: The Sacred Stones is the sequel to the original Fire Emblem, which also appeared on the Game Boy Advanced (there have been numerous Japanese incarnations of Fire Emblem, but the franchise is a Western fledgling). Stones is essentially a strategy RPG, in which the player follows a cast of characters through a prolonged story, and fights out strategic battles along the way. The story itself is strong. Ephraim and Eirika, twin heirs to the throne of Renais, are thrust into an unwanted war when the Grado Empire invades their homeland without warning. Their father dead and home occupied, the uprooted twins gather strength in allies, and then set out to right the wrongs committed. The Sacred Stones themselves eventually come into play, as the Emperor of Grado seems to have developed an unhealthy desire for their destruction. To be fair, the story is at times cliche, given the entrapment of ancient evil through a group of trinkets (in this case, the Stones), but as a whole the plot is generally superior to most RPGs, and practically anything on the GBA. The greatest quality of Stones’ story is its memorable characters. Drawn in anime style, and most them being archetypes of that genre, these characters are nonetheless likable, distinct presences. Uniquely, their interactions take place in a setup that merely shows the involved characters’ heads, with only background changes between scenes to differentiate the proceedings. It’s a testament to the game’s writing that such a thing is still interesting despite the sparseness. The actual battling is often been-there-done-that, as Stones’ doesn’t deviant far from the strategy-RPG norm, but it’s definitely a competent version of that format. It’s all turn-based affair, as characters take turn whacking each other in the face with whatever weapon’s handy. The system’s strength is that it is both initially intuitive and potentially deep. A subsystem as simple as “spears beat swords beat axes beat spears” is immediately understandable, and yet it adds another strategic layer to the proceedings, even to the end of the game. 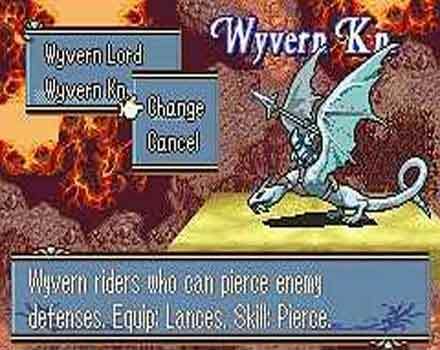 One of the things about Sacred Stones’ battle system that’s unique among the many strategy-RPGs out there is the speed with which characters are incapacitated. In a game like Final Fantasy Tactics: Advanced, characters can take a half-dozen hits before perishing. Not so in Stones. Every character class is extremely weak against at least one other--a misplaced swordsman will be absolutely shredded by an attacking spearman, usually in one strike, and often with attack power to spare. Character placement thus becomes a vital affair--a poor move won’t result in a wounded character in need of healing, but a dead one in need of burying. The speed of the combat serves to make the game’s battles quickly-paced and pretty quickly resolved, although the relatively low health of the characters becomes a desperate liability in context of the game’s death system (more on that later). There are some other unique elements at work here, strategy-wise. Weapons, for example, aren’t the permanent and singular utensils that they are in other strategy RPGs. 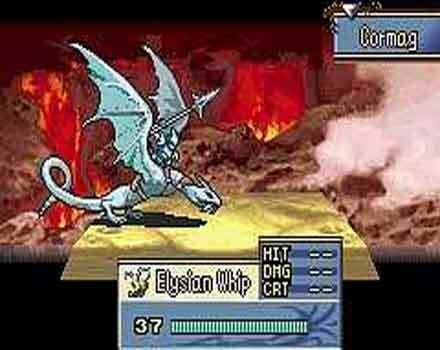 Characters can wield up to four weapons at any given time, and can use any one of them during an attack. All of these weapons have a number attached to them, and this represents the number of times they can be used before they break completely--once the number reaches zero, the weapon goes bye-bye. Thankfully, almost all of Stones’ weapons come with 30-plus uses, and buying new ones is pretty simple matter--thus, the system isn’t nearly as annoying as other games that have used a weapon-durability scheme (such as that of the original Dark Cloud). 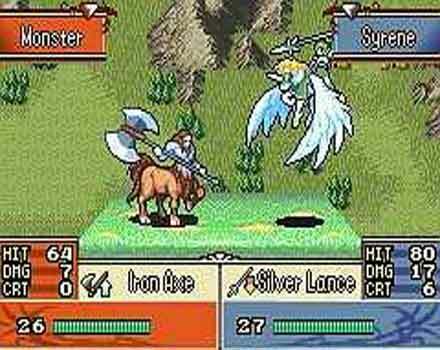 Fire Emblem: The Sacred Stones is a pretty good looking game. The coloring is vibrant and varied, and the animations during the battle sequences are entertaining even after seeing them a dozen times. The character design is solid. The major gripe to be leveled here is the lack of character animation during story sequences--whether greeting a long-lost friend or mourning the loss of her father, Eirika wears the same emotionless look on her face. It’s the same with any character. The fact that even the major characters couldn’t get an extra face drawing or two to represent the varied emotions they’ll convey throughout the tale is a poor oversight, and actually jars the realism of the proceedings. Stones features a solid score. The music sails along pretty respectfully, and almost always accurately reflects the action on-screen. There are no truly memorable tunes, unfortunately, but it’s all well-produced. Effects-wise Sacred Stones is as full as can be expected, with the various aural slaps and slashes matching perfectly with their visual counterparts. In short, Stones is audibly complete, and the game is fuller because of it. But oh, the damned death system. 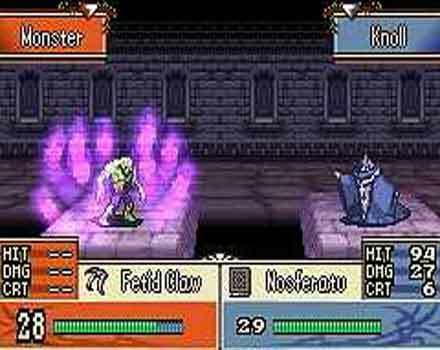 Characters in Sacred Stones, as in the previous Fire Emblem, aren’t merely omitted from the rest of a battle when incapacitated. They die. Permanently. No resurrection. Upon death, the unfortunate character offers a parting phrase, and then disappears forever, never again to be seen again, in battle or in cutscene. This inclusion is frustrating in the extreme. It’s possible to go on with the battle and the story by merely ignoring a character’s death, but this isn’t really a viable option: often, several hours of experience have been poured into a given character; some characters possess unique classes and skills that are necessary assets; and losing some characters culminates in the loss of some story sequences. This combination renders the loss of a character an unacceptable event, and the savvy player will reload the mission in order to try again without any losses. The result is that the perma-death system becomes nothing more than an instant reset-when-a-character-dies. A wee bit frustrating. There are other elements that compound the problem. Number 1: as previously mentioned, characters can and will die with a mere strike or two. This means that the player’s characters will perish from the merest oversight--characters usually don’t live long enough to pull them back for a quick heal. Number 2: healers of all sorts are understandably weak, and thus make easy targets. A conundrum is presented: include healers in one’s party, and thus accept the chance of losing them suddenly and unexpectedly, or exclude them, and forego the chance of losing some of the other characters through a lack of support healing. Number 3: enemies will on occasion sprout up spontaneously on the edge of the map behind the player’s forces. Thus the intelligent player, who keeps his weaker support characters behind his forces for protection, is rewarded with an unstoppable enemy flanking maneuver that decimates said support characters. Cool! Number 4: every now and then a mission will take place on a ‘fog’ map, in which the player can’t see all enemy positions, but only those within a few spaces of his characters. Since characters can move further then they can see on these maps, and since the AI has no such visibility qualms, enemies will regularly charge out of the mist and crush a characters that the player didn’t even know was within striking range. These things form the quartet from hell, and they aggravate an already-existing problem. Note that none of these things are issues in themselves--there’s nothing wrong with low-health characters or sneak attacks. But combined with a silly and stupid death system, they wreak their havoc as salt upon the wound. If this review has seem overly focused on said death system, there’s a reason: it is, unfortunately, the most memorable aspect of The Sacred Stones, one that dominates the gameplay and reduces the fun, open-ended battles to unnecessarily meticulous trials of frustration. It’s a testament to the quality of the other portions of the game that the Stones can survive such a poor design decision, and still be a decent game. In the end, Sacred Stones is a crying shame.